Russian companies have been paying more and more attention to the concepts and practical aspects of integrated logistics and the delivery chain, in which, not without reason, they perceive the possibilities of improving the economic effectiveness of their companies' operations, as well as increasing their competitiveness in view of the growing expansion of big international corporations into the Russian market. Using integrated logistics methods should be incorporated definitely on the stage of strategic planning of each enterprise, and the management board of the enterprise should possess instruments for assessing the effectiveness of the operation methods on the strategic, tactic, as well as operating level. Controlling plays a significant role throughout the execution of those tasks. Among the enumerated constituents the leading role in the logistic management is played by controlling. 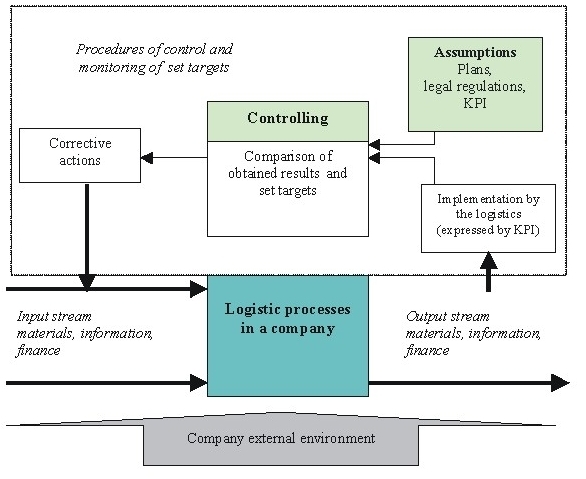 Controlling is understood as an area of a company's activity containing a supportive function for the company's executives, and including the following constituents: data processing (collecting, processing and making available to required addressees information concerning the process of business operations in the company), planning - targeted at the superior goals of the company, controlling the performance, as well as corrective and preventive actions. The tasks of controlling include collecting and processing information by means of computer EDP systems and managerial accounting systems, which are then used for planning, decision-making with regard to the financing of operations, shaping the price system, preparation of reports, analyses and statements for the purposes of auditing. Controlling should be focused on the strategic objectives of a given company and on the achievement of strategic objectives of the whole corporation, of which the company is a part. Controlling includes setting the objectives (including the strategic objectives), planning, creating instruments for performance control and also corrective actions for the current (operating) activities, depending on the results of assessment of the company's functioning (the system of Key Performance Indicators). In most cases, in order to implement controlling instruments in a given company, it is necessary to change the way of planning, accounting and economic analysis. The moment the company's management system incorporates controlling instruments, it is necessary to implement a system of detailed cost accounting (e.g. function value analysis), posting the costs and sales revenues broken down into individual products and goods, as well as market segments, customer groups, orders, cost centres for production, financial and logistic operations. Controlling can act effectively only if data are available with regard to the actual results and capabilities of the company. Therefore, it is so important to obtain (in real time) data concerning any variations between the plan and the performance for indicators including sales volume, incurred costs, income, financial balance and other KPI. The necessary condition for the proper functioning of controlling is the system of obtaining and analysing data concerning any variations and the development and optimisation of alternative courses of action. Controlling involves such processes and areas of company activity as accounting, planning, coordination, correction and supporting the company executives with information, thus creating an independent system within a given company. At the same time, controlling in its function is focused on the identification of weak links in the company's operations, fulfilment of previously set objectives in the aspect of strategic objectives of the whole corporation by means of applying basic analytical instruments, methods of coordination and correction of economic processes in the company, based on systems of balanced effectiveness indicators of the company's operation (KPI systems). The implementation of a procedure whose aim is to create and operate a controlling system consists of the following successive stages presented in Fig. 1. The system of indicators which supports the company top executives' decision-making process is the most significant element within controlling (in ideal case - Balanced Scorecard). A general flow chart of the controlling process in a logistics system is presented in Fig. 2. Control procedures in logistics should be focused on the process of fulfilment of entrusted tasks, for example on the level of order fulfilment and the process of coordination of individual functions of logistics (branches of operation), e.g. raw material procurement, production or distribution logistics. The "input data" of the controlling process in the company are plans, standards and binding regulations, which form the framework of logistics operations (analogically to processes described in the management theory). While fulfilling initially set objectives, logistics division executives encounter constraints that result from the external business environment of the company (changing prices, tax rates, inflation rate, credit costs, legal regulations etc. ), as well as from internal changes in the situation of a given company and its logistics (connected with the financial standing, applied technologies, human resources available at any given moment, etc). The above-mentioned factors lead to discrepancies between the obtained results and the initially set targets. Such discrepancies are identified in a control process and on the basis of them corrective measures are determined, modifying back the input data of the process in the logistics system. The most important stage in the flow chart presented in Fig. 2 seems to be the monitoring process, in which a corporate system of information is used. The process is carried out on the basis of periodical balances and statements, reports of logistic executives and audits. Typical data collected in the course of the process are the volumes of logistic operating costs (in total, as well as broken down into particular functions), statements of stock levels, the use of allocated budget, the level of customer service performed by logistics, the level of utilisation of available infrastructure etc. Data collected and used in the course of the monitoring process are delivered either by a qualified staff of executives, consultants and auditors, or by means of integrated computer systems. On the basis of analyses, adequate corrective actions are taken in the area of logistics processes. For example, if the level of availability of the full range of goods in a given location is s too low, the logistics manager may take a decision to increase the stock level in that location. In the monitoring process it is important to determine the level of accuracy of the collected and analysed data and the limits of deviations that trigger off corrective actions. to directly measure the results of employed measures. The process of measurement of the results of logistics management depends on the initially set objectives, diversity of functions performed by the logistics department, as well as the period and time of inspection and monitoring of the logistics system. For example, measurements for analytical purposes may be performed on a daily, monthly, quarterly etc. basis. Most often, the obtained results are averaged with regard to the initially agreed time interval. Some basic functions and areas of activity of the controlling logistics systems are discussed in more detail below. Development of a logistics strategy of the company. Development /reengineering of the logistics network of the company. Identification of the company's logistics processes, with special emphasis on the deliveries performed by the company. Approval of the organisation structure of logistics and specification of necessary human resources. Preparation of the logistics budget. Coordination of work of the logistics department with the work of other departments in the company (organisational and functional). Integrated planning of stock volume in the company's logistics system. Determination of IT demands of logistics within the existing IT system. Currently it is insufficient to use only single financial indicators in order to fully characterise the processes taking place in the logistics system, especially while taking into account the problems connected with costs of deliveries. There is often a situation that the material cost is only a (smaller) component of the total cost, which to a large extent consists of costs of "unconnected" factors, such as: available human resources, innovations, the applied method and level of customer service. Financial indicators often do not fully reflect the status or contribution of those factors to the total costs of the company, therefore there is a need to use a full system of balanced indicators, including both financial and non-financial indicators and clearly presenting incurred logistics costs. The system of logistic KPI should be part of the system of indicators for the whole company and should be built on the basis of the employed logistics strategy of the company. Within the total system of balanced indicators, we should definitely separate those indicators which directly describe the effects of the company's logistics management along with concrete measuring methods. An achievement of the desirable level of those indicators should be a target for the company's employees and it should motivate them to work effectively. There should be clearly specified principles of measurement and assessment, so that all employees could easily understand which logistic processes must be corrected and how to use available resources to their full extent in order to realise the assumptions of the company's logistics strategy. how is logistics activity evaluated by owners (stockholders) and the company's management board (financial aspect). Answers to the above questions depend on the initially set objectives of the logistics strategy of the company, which in turn are "derived" from the corporate strategy and are a part of the indicator system pertaining to the effectiveness of management. While analysing implementation of the tasks, we should also consider the possible impact ("leverage") of the logistics activity on the effectiveness of the whole operations of the company (Fig. 3). Generally, the term "leverage" of logistics will be understood as its possibility of increasing the company's profitability. The impact of logistics on the effectiveness of the company's activity should be presented both in the area of activity of the logistics department within the company and its activity connected with the provision of services to external customers. Internal and external customers should be continually shown and reminded of the value that can be given to them by the logistics department. 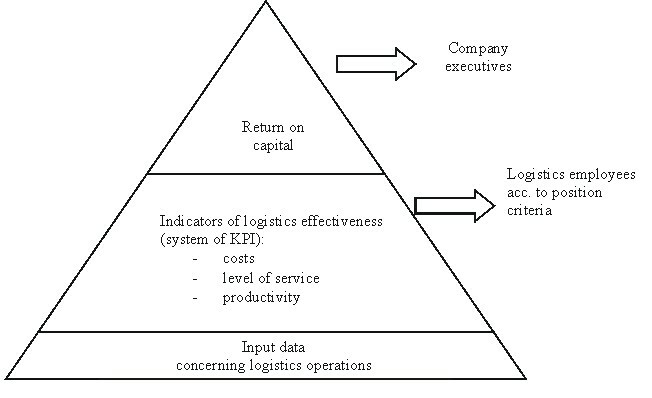 Taking into consideration various methods of evaluation of profits obtained due to the applied logistic processes, it should be noted that the most difficult (from the financial point of view) indicator to be expressed in terms of quantity is the indicator describing the level (quality) of the logistics customer service, and the most general financial indicator is the market valuation (value). The market value is increasingly often and more willingly used as an indicator, and its calculation is considered to be a stable method of analysing the value of various economic processes and also comparing alternative strategies and variants which can be used in a given company, influencing the general value of the company. In accordance with the theory of market value, the company constitutes some value only when after accounting for the investment risk in the calculation, its market value corresponds to (or exceeds) the value of the engaged capital. Such approach is based on a basic assumption: the company has the value which is the obtained net present value (NPV), that is the difference between the discounted cash flows and initial expenditures incurred by the company at a given discount rate. Due to the focusing on cash flows, the market value as an indicator avoids the weak points of traditional financial indicators. At the same time, the method takes into account the current value of the company's cash capitals and also accounts for the incurred investment risk. It objectively demonstrates the relations between the method of management and the company value, analysing the results of the management method in terms of value in the whole period subject to planning and taking into account a certain amount of key factors influencing the company's value. 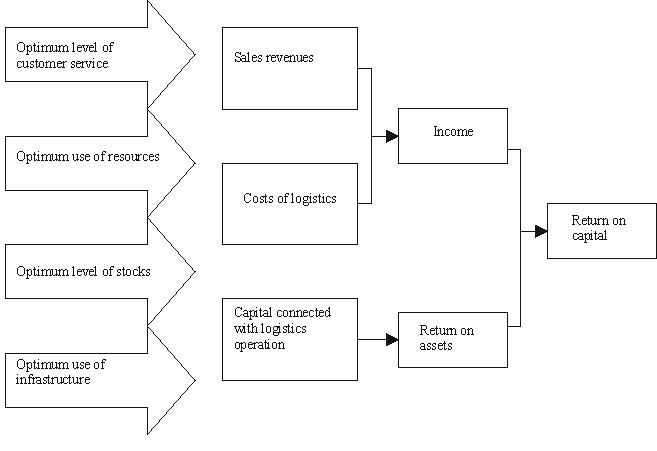 A general flow chart presenting the effect of logistics on the market value of a company is shown in Fig. 4. Methods of evaluation of the logistics activity should enable a measurement of the impact of the activity on the operating costs, the working capital and fixed assets. Otherwise, there is a danger that the logistics department's activity will not be properly assessed both by the company's executives and external customers. The above-mentioned factors should be taken into account already at the stage of planning the system of balanced indicators. (Fig. 5). The system of balanced indicators should take into account both those indicators which demonstrate the obtained results of activity and those presenting logistic processes which enable to obtain the results. Both categories of indicators should be interconnected, as in order to achieve the objectives characterised by the first group of indicators (e.g. return on capital invested in the logistic infrastrucutre), it is necessary to implement the processes described by the other group of indicators (e.g. achievement of high productivity of warehouse facilities and means of transportation). creation of a feedback system and control of the implementation of the assumed strategy and initiation of the process of training logistics department employees. Within the organisational hierarchy, the balanced indicators system should be planned downwards. The system should be created on the level of the whole company and then translated downwards into individual departments and smaller organisation units. Key Performance Indicators are the right tool for reporting purposes of the whole company, as well as presenting the logistics activity on different levels. The generally accepted procedures of the comparative evaluation (benchmarking) are used worldwide with regard to logistics activity on the basis of analytical and expert methods which make use of the indicators in question. The basic requirements set for a system of balanced indicators in logistics have been specified above. Another problem is the criteria (yardsticks) of its effectiveness and KPI system (Table 1). The yardsticks and Key Performance Indicators presented in Table 1 characterise both the internal (criteria 1 - 2) and external (criteria 3 - 5) effectiveness of logistics. productivity/efficiency of individual elements of infrastructure as well as logistics department employees. Customer satisfaction from "completed order"
Efficiency of warehouse facilities, internal warehouse transportation etc. The presented yardsticks reflect the wide range of requirements set for indicators used in logistics controlling. Table 2 shows sample specifications of such yardsticks, used in logistics reporting (System of Key Performance Indicators). Table 3 provides an example of a report making use of Key Performance Indicators. The indicators labelled with symbols L1, L3 and L5 should be controlled by senior executives of the logistics department or top executives in charge of the whole company. Most of Key Performance Indicators demonstrate the ratio of the analysed values to the base/standard values (sales volume, production volume etc.). In the course of creating the system of indicators it is very important to determine the frequency of calculation and period for which the indicators will be calculated, and the calculation method. If a corporation intends to introduce a system of balanced indicators, it should select indicators that will meet its individual needs. This should be done due to two basic reasons. Firstly - indicators should describe the unique features of the company from the point of view of competition, uniqueness of the market on which it operates, unique technology it employs, partners and cooperating parties. Therefore, there is no such thing as a universal set of Key Performance Indicators that can be used in every company. Secondly, the process of development of a system of indicators is in itself as important for the company's executives as the results of the process. B1. Total volume of sales (including export) pc. L2. Costs of storage and distribution RUB/pc. The basic problem of Russian companies that introduce systems of balanced indicators is not a selection or construction of KPI themselves, but the way these indicators could be compared against the indicators presented by other companies, for example in the benchmarking process. Benchmarking is a method of comparing products, services and procedures offered and employed in own company with those found in companies considered to be the best in the analysed business area. The process of creating the KPI system regarding the strategic and tactic logistic planning should be based on the best practices used by other companies (leaders in the industry) or the most significant competitors. However, typical features of the Russian market are: unwillingness to reveal information on own company, isolation of companies, "commercial taiga", which sometimes verges on the absurd. To be more specific, most companies located in a given area are like "black boxes" to one another (in cybernetic terms) and the only information revealed outside is price lists and tariffs and some indicators of services they offer. In this situation, it is difficult to talk about positioning a given company with regard to other companies operating on a given market, on the basis of a system of logistics KPI. Since there is no possibility of comparing the obtained values of indicators with those of other firms, it is also impossible to assess the rate and stage of the company's development. In these conditions, the creation of a KPI system may be performed by means of two methods. The first method is to determine the standard values of KPI on the basis of previously obtained values, i.e. to plan starting from the reached level and taking into account the strategic objective of the company. However, this method does not provide an answer to the question to what extent the company is competitive on the market as compared to other business entities. The method may be applied in companies that are beyond doubt leaders in a given industry. The other possible method is to run a comparative analysis (benchmarking) in relation to western companies, as results concerning the effects of logistics activity are regularly published abroad. Even the most general indicators may offer the idea and knowledge as for the direction in which the company should go. There is yet another possibility - we should look at the company through its customers' eyes and assess to what extent the level of logistics services corresponds to the customer's needs and expectations. in customer service area - present both the obtained results of the activity and peculiarities of the logistic service offered to customers, along with incurred costs. The superiority of the logistics balanced indicators is also demonstrated by the fact that it can display the level of realisation of the company's logistics strategy. An important issue is an adequate structure and logic of the whole system, which makes it possible to find mistakes in the assumptions concerning the way the company functions. If we consider the advantages of the system with regard to the logistics department, one of the basic advantages is that it forces the department employees to take greater care of the realisation of entrusted objectives and tasks. Due to the feedback function the company's executives should receive information whether the employees' motivation grows just like their knowledge and understanding the role of logistics in the company and the targets to be met. A correctly constructed system of indicators should also contribute to improving the financial achievements of the company. In the short run, introducing the system is of a subjective character, which is demonstrated e.g. by changes in the working climate in a given company, as well as an increase in motivation of logistics employees. In the long-run it displays the customers' attitude to and opinion of the company and it also translates into market and financial results. 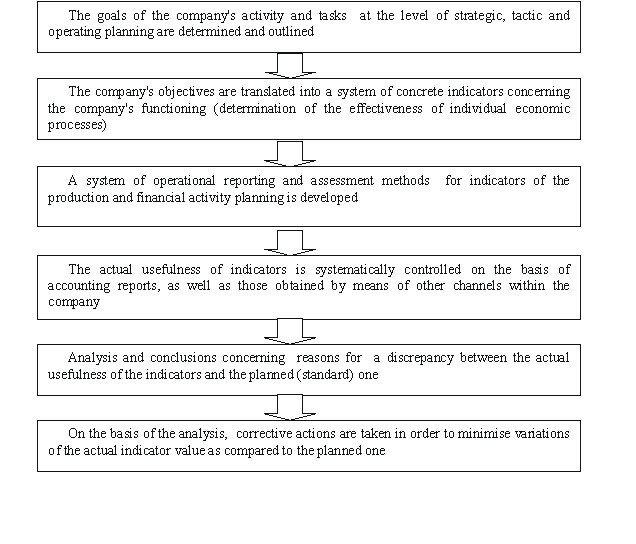 The article discusses the system of modern controlling, issues connected with planning, analysis, control and monitoring of logistic systems in industrial and trading companies and methods of assessment of differences between planned and actually obtained Key Performance Indicators in logistics, as well as methods of optimisation of actions. It has been demonstrated that in most cases in order to use controlling tools it is necessary to change the methods of planning, reporting and economic analysis in the company. When implementing controlling principles, such accounting methods should be used in which costs are posted in cost centres. An indispensable element of each controlling system is creation of a database which makes it possible to identify deviations in the system and develop alternative solutions. Controlling combines into one coherent system the following constituents: reporting, planning, regulation/correction and information flows within logistics processes. It has been demonstrated that the basis of information flow in the controlling is a system of indicators (an ideal solution is the balanced scorecard), focused on the needs of the company's top executives. Also, a general flow chart for a controlling system in a company's logistics system has been presented. The main component of the controlling system is the monitoring subsystem which uses the available possibilities of the company's/corporation's IT system. Reports and comparisons are prepared on the basis of periodic reports, reports from top logistics level employees, and audits. Typical areas covered by such reports are: operating logistics costs, reports concerning stock levels, utilisation of logistics budget, level of customer service, use of existing infrastructure, etc. STRESZCZENIE Przedsiębiorstwa rosyjskie coraz większą uwagę przywiązują do koncepcji i praktycznych aspektów zintegrowanej logistyki oraz łańcucha dostaw, w których to, nie bez podstaw, widzą możliwości poprawy efektywności ekonomicznej działalności swoich firm jak i podwyższenie ich konkurencyjności w dobie coraz to silniejszej ekspansji dużych firm zagranicznych na rynek rosyjski. Stosowanie metod zintegrowanej logistyki powinno być wkomponowane bezwzględnie na etapie planowania strategicznego każdego przedsiębiorstwa, zaś kierownictwo przedsiębiorstwa powinno posiadać instrumenty oceny efektywności tych metod działania na poziomie strategicznym, taktycznym jak i operacyjnym. W trakcie wykonywania tych zadań istotną rolę odgrywa controlling. ZUSAMMENFASSUNG. Dieser Artikel beschäftigt sich mit dem System des modernen Controlling sowie dessen Verbindungen in die Planung, Analyse und Überwachung innerhalb logistischer Systeme in Industrie und Handel. Zusätzlich werden auch Methoden zur Bewertung von Unterschieden zwischen geplanten und eigentlichen Leistungsindikatoren in der Logistik gennant, Methoden zur Optimierung dieser Prozesse werden ebenfalls ihren Platz finden. Es konnte in vielen Fällen gezeigt werden, dass zur Nutzung von Controlling-Tools es notwendig ist, die Methoden zur Planung, Berichterstattung und Wirtschaftlichkeitsanalyse zu ändern. Wenn man Controlling-Prinzipien einführen will, sollten solche Buchungsmethoden genutzt werden, wie sie in Cost-Centern üblich sind. Ein unverzichtbares Element eines jeden Controlling-Systems ist die Einrichtung einer Datenbank, die es möglich macht, Abweichungen zu erkennen und alternative Lösungen dafür zu entwickeln. Controlling bildet daher eine Kombination innerhalb eines koherenten Systems und besteht aus den folgenden Inhalten: Planung, Steuerung/Korrektur und den Informationsflüssen in logistischen Prozessen. Es konnte gezeigt werden, dass die Grunglage der Informationsflüssen im Controlling, ein System von Indikatoren ist (ideal ist hier die Balanced Scorecard), welches auf die Bedürfnisse des Unternehmens ausgerichtet ist. Es konnte auch ein Ablaufplan eines Controlling-Systems innerhalb eines logistischen Systems im Unternehmen präsentiert werden. Die Hauptkomponente dieses Controlling-Systems besteht aus der Beobachtung von Sub-Systemen und nutzt die bereits verfügbaren IT-Ressourcen eines Unternehmens. Berichte und Vergleiche wurden auf der Grundlage von periodischen Berichten, Erfahrungen von Top-Managern der Logistik und Audits vorbereitet. Die typischen Inhalte dieser Berichte umfassen: operative Logistikkosten, Berichte über die Kosten von Beständen, Ausnutzung des Budgets für Logistik, den Grad des Servicelevels für Kunden, die Nutzung bestehender Infrastruktur usw.